During the hot month of August I had a temper tantrum over the state of my garden. I felt my plants, especially the roses, were ungrateful wretches, considering all the watering, pruning, and feeding I’d given them. The plants were obviously resentful of the time I could spend basking in air conditioning while they worked through the night keeping them selves hydrated. And then September rolled around. Cooler nights perked up the roses, the amarcrinums bloomed, and the camellia ‘Snow Flurries’ blossomed, reminding me that fall was approaching. Clematises close to death began to grow and smile. In turn I decided that I actually might like my garden. One of my garden tenets is: Assess the garden. Determine what you like and what you don’t. There’s no reason to retain plants you don’t like and every season you should note those plants you savored. The following is my list of September favorites, plants that have worked in the garden. Allium ‘Millenium’ — no, this isn’t a typo. The hybridizer registered it as ‘Millenium’ rather than ‘Millennium’. Designated the perennial plant of 2018, this allium blooms for six solid weeks. The perfect plant to edge the perennial border, it is only a foot high with attractive foliage. Originally just offered by Plant Delights, it now is selectively offered at other mail order nurseries and is worth the effort to seek it out. An added plus is that it’s deer proof and unlike other alliums, it doesn’t flop. Amarcrinums — this happy marriage between a crinum and a hardy amaryllis is a fabulous addition to the garden. Smaller than the unruly crinum, the amarcrinums bloom for 4 to 6 weeks, asking little in return. I never water them nor feed them. Deer leave them alone. What more could you ask for? Plant them in a sunny spot with well-draining soil. Like crinums they resent moving around in the garden. Ferns — I was late in arriving at the fern fan club but my sunny garden has grown shadier over the years. This year I was conscious that the ferns provided a peaceful retreat when the weather was stinking hot. They root in relatively quickly while requiring very little upkeep and they are deer proof. One confession: I who proudly eschew common names, preferring the Latin nomenclature, am having trouble keeping the wide variety of ferns straight. 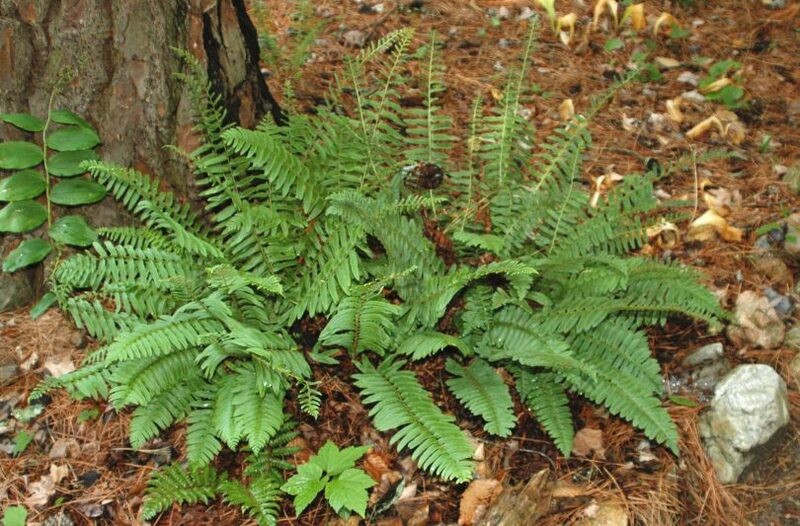 I’ve mastered Dryopteris and Athyrium but there seem to be dozens of Latin names denoting fern species. Zoysia Grass — ‘Emerald’ has performed beautifully. I have two grassy areas where we planted Zoysia to contrast the perennial garden. Requiring less water and chemicals than tall fescue, it does turn brown in the winter and exhibits a gawky spring appearance before turning green in the summer. I consider my “river of grass” an added plus to the garden. Begonia grandis — alas, this hardy begonia is a deer appetizer—but that’s its only negative. It seeds all over but seems to know where it’s wanted and it’s easy to pull out. Spigelia marilandica — this native plant, like Begonia grandis, enhances other plants. It bears small star shaped red blooms and grows eventually into nice sized clumps. One caveat: Rabbits adore this plant. The gallery series of dahlias — I love dahlias and I detest staking them. These dahlias are short, about fifteen inches in height, so they require no staking. Plant the tubers in May: I like to plant five in a mass grouping. The bloom time lasts for four months, June through September. While many gardeners lift the tubers for storage after the first frost, I leave them in the ground, covering them with a layer of mulch as they always come back, although they will begin to bloom a bit later than newly planted dahlias. Lablab purpureus — the hyacinth bean vine is a fabulous annual, sprouting from seed in April. It has lovely purple flowers and cool purple seedpods. Sources tell me that deer will eat it but the deer have left it alone on my fence. Do this kind of assessment during every season, as this will help you to plan a garden that has eye appeal throughout the year. Kit Flynn has been an Extension Master Gardener in Durham for over 13 years. Besides being a compulsive gardener in Chapel Hill, she also writes gardening articles for the Durham County Extension Master Gardener newsletter and for “Senior Correspondent,” an online magazine.